Let RetroFit Insulation, Inc. in MA and RI show you how adding insulation is one of the most important, home improvements you can make. Although it's invisible, insulation can add value and comfort to your house, even if yours is an older home. If your home was built before the mid-1970's, it may not have any insulation. Used to reduce heat transfer, insulation is a non-structural material that can make your new, or older home, or place of business more comfortable in a variety of ways, while reducing your energy costs. 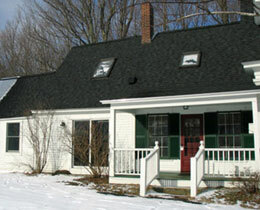 How will RetroFit Insulation help make your RI home more comfortable? RetroFit Insulation is like adding an extra blanket to your home. 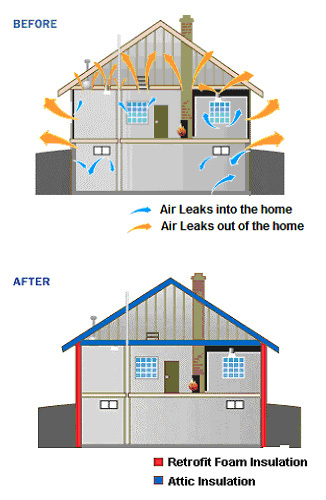 Insulation traps an unmoving layer of air next to a heat source, reducing heat transfer and increasing comfort. This means that RetroFit Insulation will keep you warmer in winter, and cooler in summer for less. If your home was built before the mid-1970's, it may not have any insulation. Low amounts of insulation, plus gaps and voids in the insulation can give paths for heat and air to easily enter into, or escape out of a home. Increasing insulation along with air reduces the exchange of heat and air, and creates a more consistently comfortable atmosphere throughout a house. 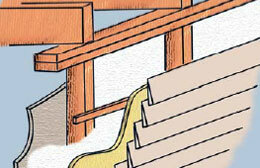 It's easy to RetroFit insulate an older home, even without remodeling. RetroFit Foam insulation can be installed from either the inside or the outside of your home depending on your requirements. It doesn't matter if your home is sided with shingle, clapboard, brick, stucco, or even stone. RetroFit Insulation can install quality insulation quickly and efficiently in your Rhode Island home. R-value measures the relative efficiency that insulation reduces this exchange of heat, with R representing insulation's resistance to heat flow. R-value varies depending on the type of insulating material. The higher the R-value of your building, the lower your energy consumption. An average home spends up to 70 percent of its energy consumption on heating and cooling, according to the U.S. Department of Energy. Higher home R-values translate into greater efficiency as well as comfort. In these times of rising energy prices, RetroFit Insulation will save you money on your fuel bills, and eventually pay for itself in decreased energy use and therefore, costs. RetroFit Foam insulation is superior to other insulation in terms of R-value, and for other reasons as well. RetroFit Insulation, Inc. can install RetroFit Foam insulation in almost any home. RetroFit Foam can save you up to 50% on your energy bills, especially in older homes that have little to no insulation now. 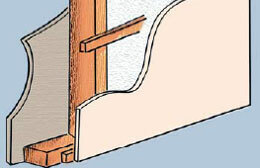 RetroFit Foam can seal your home from outside cold and rid it from drafts by flowing into nooks and crannies. RetroFit Foam can be used in virtually any type of construction, building, or structure. RetroFit Foam insulation can be installed from either the inside or the outside. RetroFit Foam (Triploymer®) is a 60% closed-cell, 40% open-cell, semi-permeable foam that in one step provides a sealed, thermal envelope. RetroFit Insulation can install quality insulation quickly and efficiently in any type of structure! Increases thermal performance over inserts and pour-in, complies with building codes HUD, ASTM & NYC-MEA, insulates lock & mortar joints, is applied after wall sections are complete. 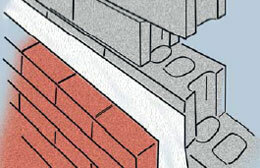 RetroFit foam-in-place insulation is easily and efficiently installed in blocks after the wall is constructed, completely filling all block and mortar joints regardless of obstructions. 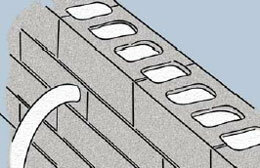 Using a pressure fill method, it is injected through 5/8" to 1 inch holes. A two-man crew can complete up to 10,000 blocks in a day. Sound Deadening reduces sound transmission, STC rating of 53, upgrade existing wall systems, for elevator shafts, pipe chases and party walls. RetroFit Foam's cellular structure provides an effective acoustical barrier against airborne sound transmissions. It can be installed in both new and RetroFit construction, eliminating sound transmissions through interior and exterior walls. 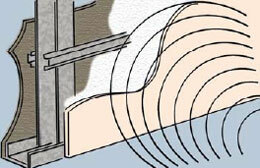 RetroFit Foam will reduce resonance vibration of interior finishes which normally amplify sound levels. Pipe Chases elminates condensation, reduces heat loss, deadens noise from water and waste lines, protects pipes from freezing. Condensation problems from water pipes can be eliminated easily and inexpensively with RetroFit Foam Insulation in both new and RetroFit construction. 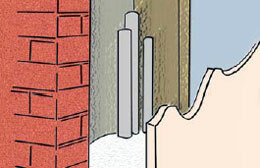 RetroFit Foam Insulation will also protect pipes from freezing by eliminating cold air infiltration and updraft. Correct Fire Wall Ratings Problems by correcting deficiencies in fire wall construction, customizing solutions for fire rating problems, stopping internal wall fire updraft, and not supporting combustion. RetroFit Foam Insulation's excellent fire properties are attributed to its unique phenolic chemistry. Tested by ASTM E-84, ASTM E-119 for steel stud, wood frame, party wall partitions, and load-bearing interior and exterior walls, RetroFit Foam Insulation will increase fire hour ratings from 50% to 150%, eliminating the need to install costly gypsum. Brick Veneer / Masonry is less costly than rigid board insulation, no cutting and fitting, less labor and time, less infiltration than with board type insulation. Unlike rigid board insulations that are labor intensive and expensive, RetroFit Foam Insulation is foamed in place at 15-foot height intervals after the masonry is up. The hose is dropped to the bottom of the cavity and withdrawn as the cavity fills, flowing around wall ties and other obstructions, leaving no voids. Cluster Projects / Town Houses perfect because it is fast and easy to install, upgrades buildings already inhabited, and uses less interior labor and less cost, less destruction required. Many cluster developments fail local and state fire ratings after construction is complete. RetroFit Foam Insulation can easily correct faulty construction violations to meet today's building codes. Firewall rating can be increased to meet codes without the costly addition of double layer gypsum boards.